Grilling juicy BBQ Pork Chops can be a daunting task especially if you've never done it before. With our guide we're going to walk you through this process and the steps necessary to make this happen. Let's get started. Pork chops are most favored by chefs for their ability to be roasted or grilled or fried. And at special occasions, pork chops or just "chops" as they are commonly known are sliced along the horizontal length of the chop and stuffed with elegant ingredients like roast vegetables or potatoes and in some cases oyster stuffing. Pork chops are traditionally cut between 1/2 and 2 inches making them somewhat thick and juicier for smoking recipes. Pork has been on menus for thousands of years and in the United States, pork chops are cut from the pork loin section. Pork chops are extremely popular and make an excellent choice for grilling. The pork loin has a section known as the center and from that centermost chops are taken. That center area also includes a section in which T-bone sections similar to T-Bone steaks are taken. Rib chops come from the lower loin portion and are sliced accordingly. 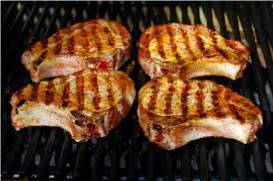 There are a number of names for pork chops such as "Bacon Chop" and "Iowa Chop". These cuts are derived from the shoulder end segment. Pork chops are best when they are fresh and seasoned perfectly. Some prefer to have their chops marinated with various ingredients while dry marinating makes for quick grilling. Since pork chops come trimmed we'll start our barbecue process by ensuring that the chops have been thoroughly cleaned. Run the chops under a cool faucet rubbing your hands over the chops. Check to ensure that no bones or grit remain on the chops from the cutting and trimming process. We'll be using our basic and most versatile seasoning, our Tri Tip Steak and Rib Rub. This is an excellent seasoning because the ingredients were designed to handle the deep marinating requirements of pork ribs, pork chops, steaks, and Tri-Tips. After washing pat dry the pork chops with a paper towel or something that will not leave lint behind. If you use any kitchen towels in the process be sure to immediately drop those towels in the washer or store them in the hamper until the next washing cycle. DO NOT clean your counter surfaces with the towels after you have dried your pork chops. In fact, we like using a bleach and water mix that follows the cleanup process. This ensures that any potential bacteria is killed off in the process and also ensures the health of you and your guests. Rub the pork chops with a little yellow mustard. The mustard as a light bit of tartness and will give the dry rub an additional foothold when it is added to the chops. Place the chops in a plastic bag or container and allow them to marinate in the mustard for about an hour. Once marinated remove the chops and sprinkle them generously with the Tri Tip Steak and Rib Rub. Coat both sides of the pork chops as evenly as possible. Now place the chops back in the plastic bag or container and allow them to rest in the refrigerator for at least an hour. I like the two-hour time frame which allows the meat to sweat a bit and aids in the absorption process. So in total, the meat will marinate for three hours. While resting the chops you can begin setting up your barbecue grill for the cooking process. Much like steaks, we will want to have hot and cool zones on the grill. Since pork chops cook fairly quickly we'll be adding about 40 charcoal briquettes laid out to one side of the grill. You can use non-light briquettes because we want to grill the chops without the smell of lighter fuel. To get the charcoal started I suggest using a charcoal chimney. If you do not have one you can take about 10 briquettes and place them on the opposite side of the grill away from the charcoal you put in earlier. Now the base of the charcoal should include newspaper or some form of starter kindling. If you don't have either of these then I would suggest grabbing some lint from your dryer. The lint is an excellent alternative to newspaper and generally is readily available since most people just throw out their lint. Start the charcoal and let them burn for about 20 to 25 minutes until they appear almost ashed white. Once the ashed state appears to use a set of long tongs and move the burning charcoals onto the 40 briquettes that are already there. This addition and burning process will take about 30 minutes. So it's a good idea to calculate the grill startup time into the marinating time so that everything comes out right. Now's the perfect time to add wood for smoking. Choose your desired wood then add about 6 ounces. If you have wood chips spread them evenly over the coals. Since the temperature will be fairly high it's a good idea to soak the wood chips beforehand for about 20 minutes. The soaking process will slow down the burning so that the chips aren't burned up in the first 5 minutes of grilling. With the charcoal and wood ready and the grill grate on open ensure the vents are wide open on the top and bottom on your grill. Now place the lid on the grill and allow the temperatures to normalize for about 5 minutes. Check the temperatures with a remote thermometer or a standard metal kitchen thermometer realizing that kitchen devices may not be as accurate as the remote types. We're after a grilling temperature of about 400 degrees. We'll be using the medium heat to cook the pork chops. Now comes the critical parts of this process. Bring out the pork chops and place over the medium heat portion of the grill. Allow the chops to grill on one side for about 2 to 3 minutes depending on the thickness of the chops. Then rotate the chops 1/4 turn and allow them to continue cooking for another minute. We turn the chops to achieve those great grill marks that you often see in the photos. After the minute is up, turn the chops again on the medium section of the grill. Allow them to grill on that side for 2 minutes. Then rotate the chops and allow them to grill for an additional two minutes. It's important to remember that each time you turn the chops you're removing and replacing the lid of the grill. The focus is to cause not only a grilling effect but a combined roasting effect as well. As for overall cooking temperature, we are looking for an internal temperature of at least 145 degrees which the FDA (Food and Drug Administration) considers safe. After the temperature is reached place the chops in a container and place a paper towel or some foil over the container. Allow the chops to rest in the container for at least 5 minutes. As with most every other meat, it will continue cooking until it stabilizes. After the resting period, you can serve and slice as desired. This is a wonderful recipe with process steps that will undoubtedly improve the results of your pork chops. But we know that we are not the only recipe for grill pork chops that exists. We think we have a great recipe option that you will love. Check out this recipe on Jens Reviews for Seared Pork Chops with Creamy Garlic Sauce Recipe just the words "creamy garlic sauce" makes my mouth water. Give this recipe a spin and take a look at our products below. We know there are a boatload of products on the market with all kinds of fancy names. We, however, focus on some straightforward terms to make it easier for our users. Below we’ve listed our key seven dry rubs and our standing of natural barbecue sauces to give your BBQ Pork Chops a head start. Each of these is excellent in Pork Chop recipes. Get these amazing bbq rubs and sauces for sale today. Our finest bbq rubs and sauces for sale are available online on our website Jake's Famous Foods. See our natural bbq rubs and sauces for sale today.